The doctors at McCormick Vision Source in Austin, TX have extensive experience in the pre-operative evaluation and post-operative care of LASIK and other vision correction procedures. If after the pre-operative evaluation, the decision is made to proceed with surgery, your information will be forwarded to the surgeon, a pre surgery consult with a surgeon will be scheduled. Post-operative management will be provided by our eye doctors, and includes multiple visits over a period from the date of surgery to include medical evaluation and management of the vision and corneal healing. Evaluation of any additional needs such as reading glasses, sunglasses, or enhancement laser procedures is also included. Our optometrist in Austin, TX take care in offering sound recommendations. 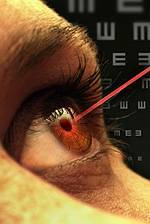 Both nearsighted and farsighted people can benefit from the LASIK procedure. With nearsighted people, the goal is to flatten the too-steep cornea; with farsighted people, a steeper cornea is desired. Excimer lasers also can correct astigmatism by smoothing an irregular cornea into a more normal shape. McCormick Vision Source is proud to be a member of the American Optometric Association and to be enrolled as InfantSEE® providers.